Customer’s reviews are a powerful tool that strongly affect your online store’s conversion rates and – if implemented properly – click through rates in your SERPs. This article will cover just how much do they affect it in numbers and point out some of the best practices in acquiring these reviews and implementing them properly into your store. Well known eCommerce solutions such as Magento have a built-in product review functionality. The problem with it is pretty obvious: the store owner can moderate the reviews and some customers are well aware of that. This means you could simply disapprove or edit negative reviews, which sounds as an awesome feature but it makes experienced users doubt in the quality of your review score. Does amount of reviews matter? Short answer: Yes it does! An aggregate rating of 5 out of 10 stars means a lot more if 50 people left the review compared to the same rating with only 5 reviews. Most customers are very aware of this and you’d be amazed just how much a large number of reviews can increase your conversion rate. According to Reevoo, a company that analysed 2.5 million customer reviews, there is no cap on how many reviews add to your conversion rate. The more you have the higher the rate is. Interesting part of their research is where they concluded that there is a very small difference in the range of 10 and 30 reviews in regards to improving your conversion rate (~3% vs ~3.3%). As you can see in the graph on the left, it’s pretty much the same thing if you have 20 or 30 reviews, but conversion rate starts going up rapidly after that. 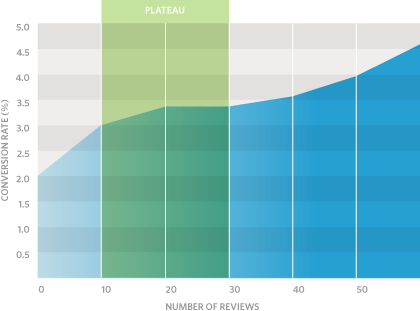 There is also a pretty big difference in range of 0-10 reviews and above, raising your conversion rate by 1% with the first 10 reviews on a product. The affect of user reviews on SEO is pretty obvious. It’s a fresh, unique piece of user generated content that search engines can index and it enhances and enriches the content you provided in product description. It also enables you to rank for “product name review” keywords which are in some niches used pretty often. Product reviews bring another thing with them that doesn’t have much to do with SEO: they improve the rate at which users click on your result in the search. So lets move on to the numbers. Just how much improvement in CTR can you expect after implementing reviews? According to Reevoo, we’re talking about 10-20% increase in CTR, depending on the amount of reviews and aggregate score. How do you display reviews in the search results? In June, I wrote about Schema.org, a new microdata standard that 3 major search engines agreed upon. Schema.org has standardised markup for reviews and agregate reviews that can be implemented into your online store. If you’re trying to implement them into Magento, you can talk to us, we have lots of experience with it. Yes, is true. I’ve thought to made this extension writing the lines which are modified/added in default theme. I’m not so professional and I saw that at Inchoo every change is made in a professional mode. For example, in my website is the default theme and I had change a little bit in theme (the css and images), nothing more. Now I’ve saw that you have articles here to… how to create a new theme and how to build a theme properly which I’ll read very soon to create a new theme. You’re doing great job here and when I have a question I like to ask professionals, that’s the reason that I’ve ask you for creating that extension. I’m no developer but I’m pretty sure it is not something you can solve with an extension since these snippets need to be integrated into your theme. Thank for information. I’ll looking in my Magento to implement “add review” link in more places. Reviews are a MUST from now on. About the microformats (which you remember in the end of the post), can you make an extension to implement them in Magento? Toni – You make a great case here that I think anyone not using reviews would immediately get. Looking at the conversion data, your arguments around review visibility and search CTR I’d say reviews have moved from the role of a “boost” that ups conversion and over to a simple necessity. At 10-30 range it’s fairly flat not because the count isn’t useful but because it’s simply expected as shown in the dramatic (33%) lift from 0 to 10.